Looking forward to returning to one of our favourite places to commentate over Competitive FIFA! Can I follow the tournament on Twitter? Updates will be provided on the official Gfinity Twitter page. Also be sure to search the hashtags #FIFAeWorldCup and #Gfinity as well as looking up Gfinity LQE and Gfinity FIFA Series in the Twitter search bar. Don’t forget to follow your favourite players competing in the tournament, along with their respective clubs/organisations who are likely to provide real time updates on their progress. A total of 32 players from around the globe have qualified for the Gfinity FIFA Series February. The full list of qualifiers can be seen below. The Gfinity FIFA Series February will take place in London at the Gfinity Esports Arena. It follows last month’s Gfinity FIFA Series January LQE, which took place at the same venue. It is the second of three licensed event qualifiers to be played at the Gfinity Esports Arena over the next three months. The tournament will be contested on Patch 6, despite the release of a new patch a few days ago. As a result of last weekend’s third FUT Champions Cup tournament of the season, our very own TSZ Player Rankings Leaderboard for both Xbox and PS4 has been altered dramatically. The winner of the event Dullen Mike has shot straight to the top of the Xbox leaderboard ahead of F2Tekkz. However with Mike not competing this weekend, the 17-year-old Brit has a golden opportunity to regain his place at the top of the table. Despite being considered the best FIFA 19 player in the world right now by many, Tekkz hasn’t won an offline event since the PGL Cup in Bucharest back in early December. He’ll be hoping to get back among the trophies this weekend. Whatever happens though, it’s been a memorable year for the player who burst onto the FIFA eSports scene this time last January. As mentioned above, this is the second of three successive LQE’s to be run by Gfinity. 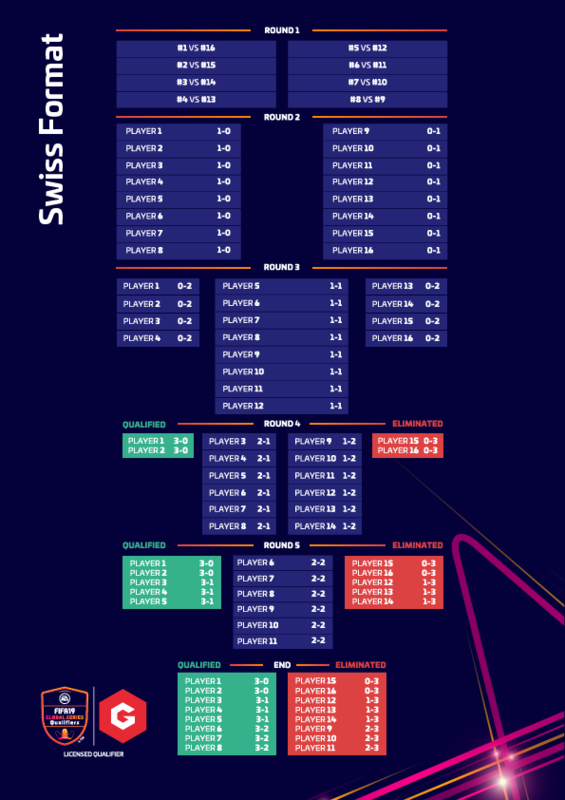 The winner of the first of those events last month was Nicolas99fc of FC Basel 1893. He remains the only player to have won an offline event that competes on the PlayStation 4 as the FIFA 19 season continues to be dominated by Xbox players. The Argentine star currently tops the TSZ PS4 Rankings Leaderboard along with the PS4 Global Series Leaderboard and will look to extend his lead at the top of both tables this weekend, with a second successive LQE triumph at the Gfinity Esports Arena. Alongside Nicolas on the PS4 will be Belgian Stefano Pinna. Despite another strong offline performance last weekend, the PSV Eindhoven player couldn’t bring home his first trophy of the season. Despite us tipping him to win the whole tournament, Pinna fell in the PS4 Console Final to cap off yet another close-but-no-cigar story for the FIFA eWorld Cup runner up. It’s difficult to see this weekend being any different for a player who will likely have to get past Nicolas if he wants to win it all this weekend. There’s no doubt the eDevil has the game to do it, but does he have the mental strength to finally jump that all important Championship Sunday hurdle? The final player we’re eying up competes on Xbox and is currently third on our TSZ Players Rankings Leaderboard. MegaBit of Werder Bremen has won on the offline stage before, winning the Xbox One Global Series Playoffs on FIFA 18. The German has perhaps not started FIFA 19 the way he would have liked, but seems to be coming back into form whilst playing the Virtual Bundesliga. This weekend marks his return to the offline stage and he’ll be desperate to get himself back amongst the elite with his first trophy of the season. With three of the five offline tournament winners of the season so far absent from this weekend’s event, the field is left wide open for potential upsets and new names to be established at the Gfinity FIFA Series February. Having said that we’re going for a familiar face to take the major prize. Bar one shaky knockout game, he was unstoppable as last month’s LQE in London and we expect Nicolas99fc to be in a similar mood this time around. Rock solid at the back and dangerous up top, playing on the old patch will be a huge benefit for the Argentine and we’re predicting him to pick up his second Gfinity FIFA Series trophy in succession.